First cucumber harvested on July 31st! Landrace gardening is a traditional method of growing food in which the seeds to be planted next year result from the survival of the fittest in a particular garden in previous years. Landrace varieties become attached to a region, and thrive in that region. Landrace varieties are genetically variable so that as conditions change from year to year the population can adapt to the changes. The first landrace crop that I grew was Astronomy Domine sweet corn. It was the product of a breeding project by Alan Bishop of Bishop’s Homegrown in Pekin, Indiana. The essence of the project was to throw as many cultivars of sweet corn as possible into a field, let them cross pollinate, and see what survived and how the descendants fared. 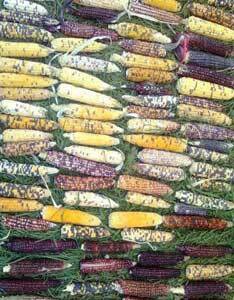 Around 200 cultivars contributed their diversity to the gene pool. Some plants grew vigorously, many grew decent, and some struggled to survive. I saved seed from the parents that thrived and that did okay, and replanted the next year. The results were fantastic! I was hooked on growing genetically diverse crops and saving seeds from them. My version of Astronomy Domine had diverged from the original version. My population is about ten days shorter season than the original. That is to be expected because in my cold mountain valley a crop has to produce quickly and thrive in cool nights if I am to get a harvest. After the stunning success of the sweet corn project, I determined that I wanted to explore growing other varieties of localized landrace crops. Melons seemed like a good test project, because they have traditionally done poorly in my valley, and because they are highly popular. Melons are an out-breeding crop, so they cross-pollinate readily, and can produce huge numbers of genetically unique individuals. Generating lots of variety is one of the key principals of landrace gardening. More diversity provides more opportunities to find family groups that thrive in any particular garden. To start the cantaloupe project, I gathered together the seeds from the few melons that had produced a fruit the previous year, and I added to them as many varieties as I could obtain: from local farm stands, from the Internet, from seed catalogs, from the grocery store. 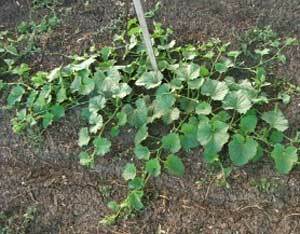 I planted a packet of seeds per row until I had planted a large patch of melons. Then I sat back and watched one melon disaster after another. Some varieties didn’t germinate. Some varieties were eaten by bugs within days of emerging. Others just sat there and shivered in the cold. Some individuals shrugged off the adverse growing conditions and grew robustly. The two best growing plants produced more fruit than the rest of the patch combined. Here are photos that demonstrate the differences. Each seed was planted on the same day, a few feet from each other in the garden. The photos were taken a few minutes apart. The first photo shows what an average cantaloupe from a seed packet grows like in my garden. The second photo shows what a well adapted cantaloupe grows like in my garden (after only one year of selection). 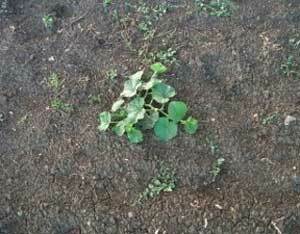 I collected the seed from the best growing melons and replanted it. Oh my heck!!! I was used to trying to grow maladapted cantaloupes. I never imagined that cantaloupes might actually produce an abundant harvest for me: I was harvesting a hundred pounds of fruit at a time! 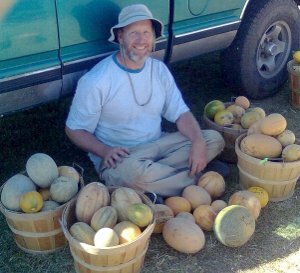 Early in the process of developing a locally adapted cantaloupe population, I was contacted by a grower who grows in the same mountain valley as my farm. Since that time, we have shared seeds liberally with each other. I trust her seeds implicitly, because we share the same climate, the same soil, the same altitude, the same bugs, and the same philosophy towards diversity. Her seeds thrive in my garden because our gardens are so similar. I love our collaboration. It is nice to see the grandchildren of my seeds coming back home to grow among their cousins. Half of the watermelon and cantaloupe seeds that I planted this spring were grown by her. She provided most of my sweet pepper seed. I am coming to favor the yellow watermelons that are emerging from the collaboration. They taste excellent and grow well in our valley. When did anyone ever say that before about watermelons in our valley? The watermelon project included collaborators from around the world. We have shared seeds liberally among all participants. The most reliable imports into my garden have consistently came from the collaborator in my valley. To start the watermelon project, I planted around 700 seeds: A few seeds each from as many varieties as we could get our hands on. The first planting included the promiscuously pollinated hybrid offspring of hundreds of varieties. I harvested about 5 fruits the first year. That is great odds for a survival of the fittest plant breeding program. 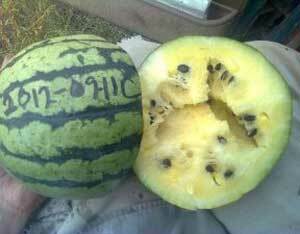 One of those fruits was from the variety of watermelon that my daddy has preserved for decades in our valley. Because of my success with cantaloupes, I decided to convert all of my crops to locally-adapted survival-of-the-fittest landraces. Spinach was among the first crops that I converted. It was the simplest for me. I planted a number of varieties of spinach next to each other and weeded out the plants that were slow growing, or quick to bolt. About 4 of the 12 varieties were suitable for my garden. I allowed them to cross pollinate and set seed. This spring someone gave me a packet of spinach seeds so I thought I’d plant it next to my locally-adapted landrace to compare them. See that little speck of green that I marked with a red dot? That is the imported spinach: Already gone to seed. 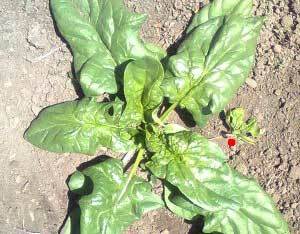 I pulled it and laid it next to my landrace spinach to demonstrate the huge difference in growth. They were planted on the same day a few feet from each other. Sometimes when I start adapting a new crop to my garden, I import hundreds of varieties to trial. Other times I take a slow and steady approach, by growing one new cultivar in the row next to my crop. If the new variety does well then I save seeds from it and add them to the landrace. If the new variety does poorly, then it might contribute some pollen. I do not try to keep varieties pure, other than basic things like keeping hot peppers separate from sweet peppers, and sweet corn separate from popcorn. 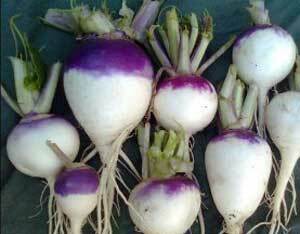 Turnips are a crop that I approached by the slow and steady method. They already grew well for me, so there wasn’t any reason to search far and wide for something that would do better. I plant another packet of seed every few years, and may include a couple of roots from the new strain among the seed-parents the following year. 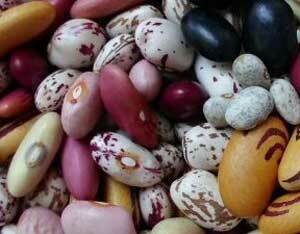 The dry bean landrace has been fun for me because it is tremendously colorful. It draws lots of attention at the farmer’s market. I started it by planting beans, all jumbled up together from as many species and cultivars as I could acquire. I think that there were around 12 species, many of which I had never grown before. I planted them in hot weather, not knowing that some of them are cool-weather species. I didn’t know if they were bush beans or pole beans. Nevertheless, some of them grew very well and produced a harvest in my short growing season. I collected the seeds of the survivors and planted them a couple weeks ago. This year I am expecting them to do great, because I selected (mostly) for bush types whose parents thrived in my garden. I tend to give my crops names that describe the plant or its use, such as “dry bush bean landrace”. “Dry bean” describes what the crop is used for, “bush” describes how it grows, and “landrace” implies that it is genetically diverse and has been localized to my garden by passing the survival of the fittest test. Some crops can achieve the landrace label in my garden in one growing season, other crops may take many years before I could say that they are thriving in my garden. I could write and write about how successful landrace gardening has been for me, but it would just be more of the same: The locally adapted plants thriving, and the imports from far away struggling to survive. I hope that this post has helped show in photos why I believe that landrace gardening is a path towards food security through common sense and traditional methods. Next time I’ll write more about naming all the new plants that arise in a landrace garden.